The Small Faces formed in June 1965 in London's East End. Ronnie 'Plonk' Lane, Jimmy Winston (born Jimmy Langwith) and Kenney Jones had started out as a pub trio. They met Stevie Marriott whilst he was working in a music shop in East Ham. Marriott was a former child actor who'd appeared in a London production of 'Oliver' as well as in various TV and radio programmes and shows. He'd also recorded a 45, Give Her My Regards, for Decca in 1963 and been on a US 45 by The Moments. They were all R&B fans and targetted their music at the emergent mod/R&B market. The name 'Small Faces' was chosen because of their lack of height and their desire to be a 'face' (in the mod sense, as in The High Numbers' song I'm The Face). They were one of hundreds of British beat groups playing R&B and soul in the mid-sixties but it was apparent from a very early stage that they had that X ingredient to succeed. They signed to Decca and recorded an Ian Samuel-penned song, which he also produced, What'cha Gonna Do 'Bout It? Although the rhythm structure was lifted from Soloman Burke's Everybody Needs Somebody To Love it was a really punchy 45 and the guitar work was sufficiently unique to take it into the UK Charts, where it peaked at the No 14 slot, although Marriott later admitted he could scarcely play. After this first 45 Winston was replaced by Ian McLagan, who'd been keyboard-player with The Muleskinners and Boz and The Boz. Winston, meanwhile, formed a new group Jimmy Winston and His Reflections. Their next single I Got Mine was written by Stevie Mariott and Ronnie Lane for an uninspired movie about a jewel theft involving a pirate radio ship called 'Dateline Diamonds'. By all accounts the best bit of the film was a live set by the band. The group's appearance in the film should have guaranteed another hit, but due to a mix up the film was released too late to assist the single which had already narrowly missed the Charts. The group could not afford another flop and at manager Don Arden's insistence a very solid, commercial Kenny Lynch / Mort Schuman song Sha La La La Lee was released as their next 45 in late January 1966. It took them into the Top 3 but in retrospect was one of their less interesting singles, being extremely poppy. By now the band had built up a considerable live following. They'd had a residency at the Cavern Club just off Leicester Square in London's West End and had undertaken a UK and European tour. Their next 45 Hey Girl was another very commercial number which Marriott and Lane had written themselves. It gave this songwriting duo their first self-penned Top Ten hit but underscored their image as a 'pop' band when they really wanted to play rock and blues. 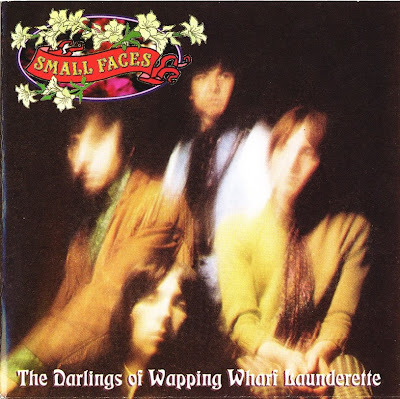 Their debut album Small Faces gave them the opportunity to be a little more self-indulgent. Aside from their hit singles, What'cha Gonna Do 'Bout It and Sha La La La Lee , it included less poppy material. There were a number of Marriott/Lane compositions dating from their early Decca recording sessions. It sold very well spending six months in the Album Charts and climbing to No 3, where it stayed for seven weeks. Their next 45 All Or Nothing, another Marriott/Lane composition, was a landmark for the band for two reasons. It was their first and only No 1 and it was more rocky than their recent material. By now the band should have been planning to take the States by storm and indeed they were, but a short promotional tour which was to be followed by a full scale tour had to be cancelled when it became known that McLagan had a drugs conviction which debarred him from entering the States. The group's inability to tour America was the major reason they sold relatively few discs there. Their next 45, My Mind's Eye had a melody partly culled from the hymn Angels From The Realms Of Glory. The record company in its impatience to release a follow-up to their No 1 released an unpolished demo from the studio without the group's knowledge. This lead to an irreparable deterioration between the group and the label, although it caused the group some amusement that in their haste the label had released this rough mix when a much more polished recording was also in existence. Still the 45 went down well and got into the Top Five. After their seventh single I Can't Make It stalled at No 26 the group announced that it was leaving Decca to sign for Andrew Oldham's Immediate label in March 1967. A couple of months later Decca released a new single Patterns without the group's agreement. The group consequently refused to promote it and even went to the lengths of telling their fans not to buy it, so it flopped. Within a week Immediate issued Here Come The Nice, a 45 whose oblique drug references neatly captured the mood of the Summer of 1967. The 45 got to No 12. Decca responded by rushing out a second album of early material (which the Patterns 45 had been taken from) titled From The Beginning. Immediate released a new album Small Faces in response and both labels splashed out on big adverts in the music press to help promote their albums. Immediate won the battle narrowly because Small Faces peaked at No 12 whilst From The Beginning could only manage No 17. The Immediate Small Faces album was the first the band were happy with. They produced it themselves. Itchycoo Park, released in August 1967, was the band's finest moment on 45. It was one of the very first 45s to use phased drumming and with its spacey harmonies too it was their most experimental single to date. The music press was quick to herald the arrival of psychedelia in London's East End. It was a big commercial sucess, too, climbing to No 3 in the UK and peaking at No 16 in the States to give them their first US hit. The group underscored this when they appeared at the 'Festival Of The Flower Children', a three-day event held over August Bank Holiday on the Isle of Man. The next few weeks were spent touring feverishly - so much so that in November Stevie Marriott collapsed from nervous exhaustion and fatigue during a tour of Ireland which had to be cancelled. After resting up Marriott and the boys bounced back in December 1967 with another superb 45, Tin Soldier. By now they'd become a really tight musical unit, the end result was a very early hard rock sound with Marriott's vocals at their punchy best. It got to No 9 here and No 63 in the States. In January 1968 Ian McLagan married Sandy Sargent, a 20-year-old dancer, in a secret ceremony at Marylebone registry office. Unfortunately the planned honeymoon was dashed when McLagan was caught with a lump of hash on him at the airport and they both got arrested. The band had to get them bailed out. Their next 45 Lazy Sunday was apparently about Stevie's neighbours in Chiswick who were always complaining about the noise he made. It was quite unlike the previous singles and sung in a good-time style more akin to The Kinks with Stevie Marriott singing in an exaggerated cockney accent. It entered the Charts at No 2, becoming their second biggest hit. Jubilant with this success they set off on a tour of Australia with The Who and Paul Jones but were deported, along with The Who, after an in-flight disturbance and labelled by the press as 'dirty, beer swigging ragamuffins'. Their next album Ogdens' Nut Gone Flake appeared on 24 May and immediately topped the UK Album Charts where it spent six weeks. It came in a round cover (representing the lid of an Ogden's tobacco tin) and one side was linked by narrations by comedian Stanley Unwin. The album later peaked at No 159 in the US. It was one of the albums of the period. A concept album, it was up there with The Beatles' Sgt. Pepper, The Pretty Things' S.F. Sorrow and The Who's Tommy. The Universal released in June was almost free-form in style. It got to No 16 in the UK. In October 1968, the band began a UK package tour with The Who and Joe Cocker. During the tour Peter Frampton guested on guitar on some of the dates and built up a friendship with Stevie Marriott. When the tour finished Marriott and Lane produced The Herd's next single Sunshine Cottage and then Frampton helped The Small Faces with their work on Skip Bifferty's album. A few months later in February 1969 Stevie Marriott left the band to form Humble Pie with Peter Frampton. The remaining members regrouped in June 1969 with guitarist Ron Wood and vocalist Rod Stewart to form Quiet Melon and then The Faces. In March 1969 Immediate released a posthumous single Afterglow (Of Your Love) which got to No 36, although the band was now defunct. The flip side Wham! Bam! Thank You Man was a heavy rocker. The Autumn Stone, a double album, followed in November. Aside from the inevitable 45 and album tracks, it included live numbers from a concert at Newcastle City Hall. However, with the band no longer in the limelight, it failed to chart. This wasn't the end of the story. In 1973 Ogdens' Nut Gone Flake was reissued in the States and got to No 189. Then in January 1976 Itchycoo Park, probably their finest 45, was reissued and got into the Top Ten for a second time. This prompted the reissue of Lazy Sunday which got to No 39, which in turn prompted the band to reform (although Rick Wills not Ronnie Lane filled the bass slot). Like most reunions it was pretty short-lived and unsuccessful. Ronnie Lane later became ill with multiple sclerosis and after a long battle with the disease died on 4th June 1997. Stevie Marriott too was tragically killed in a fire at his home in April 1991. The Small Faces were one of the foremost mod bands. Stevie Marriott is widely considered to have been our finest male soul singer of the sixties and the band's influence in recent years has been enormous.